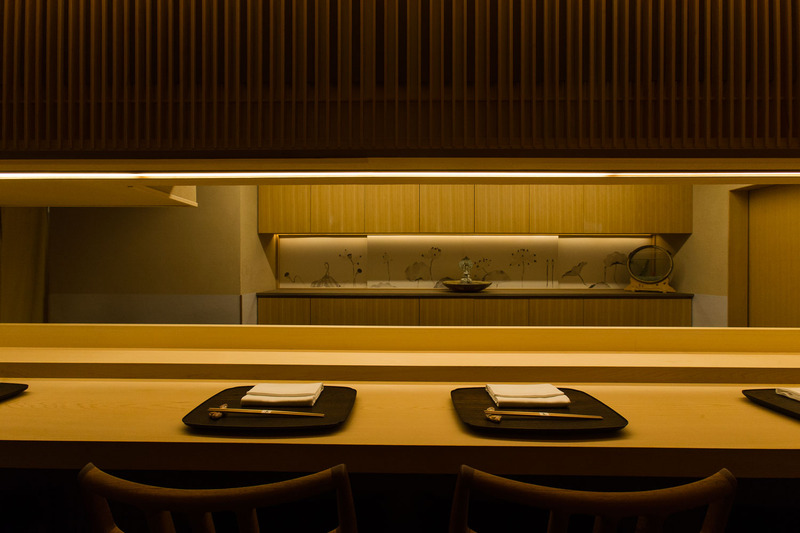 Pure and refined, bringing innate flavors to life, dining at Ren is a chance to meditate on the bounties afforded by Japan’s rich natural environment and the skilful and delicious simplicity of true Japanese cuisine. True to the name ‘Ren’, lotus flowers floating on a pond, the cuisine is deeply satisfying in its elegance, beauty, and calming quality. 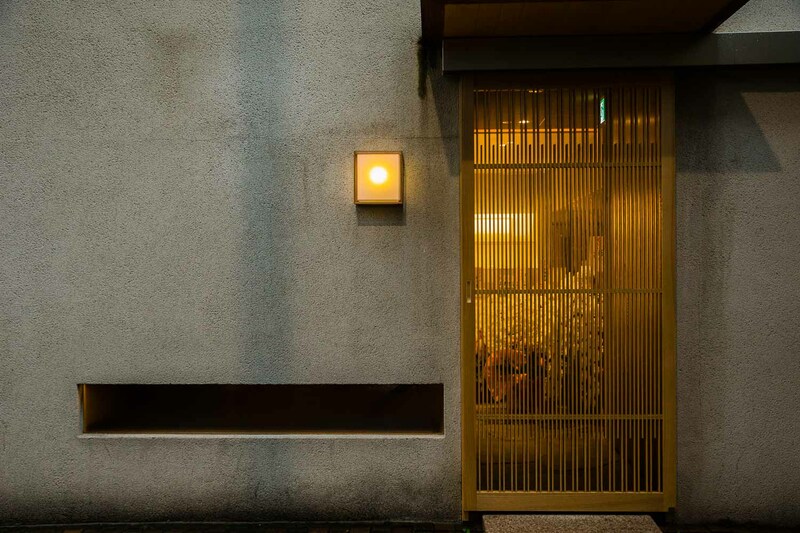 A stroll through Kagurazaka in central Tokyo is like a lesson in Japanese aesthetics. Amidst temples, a cobblestone thoroughfare and narrow laneways, the gentle clip-clop of wooden geta on stones makes you turn your head, and you catch the graceful figure of a kimono-clad geisha slip inside an old wooden building. From the busy Kagurazaka-dori, you enter an ordinary building, but beyond the wooden lattice sliding door a tranquil world awaits. 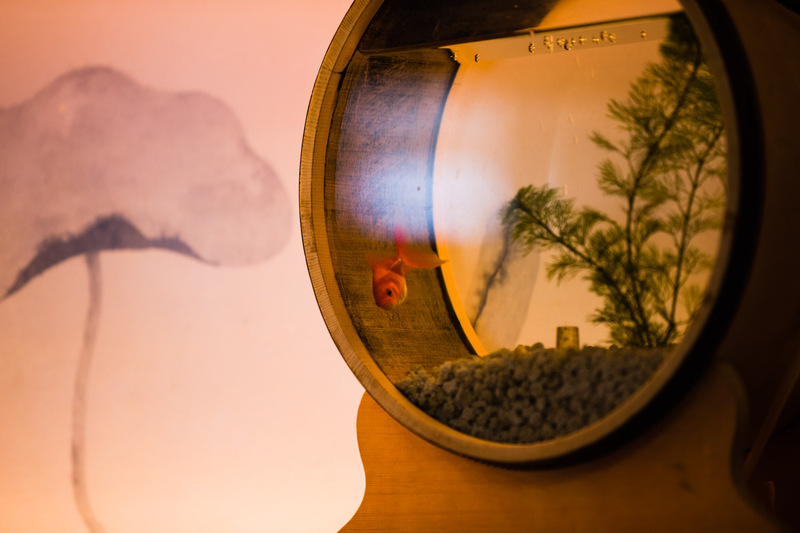 Against the backdrop of an ink drawing of lotus flowers sits a meditating stone figure in a half-lotus position, and two goldfish swim playfully within their glass orb in an underwater bonsai garden – the setting is a picture of Zen peacefulness. It is a true reflection of the chef’s calm demeanor and the purity of the cuisine to come. Focusing on simplicity, Chef Mishina is committed to drawing out to the fullest the innate flavors of his ingredients. Addressing each item, he contemplates how best to showcase its goodness, directly and without an ounce of fuss. As each dish arrives, it is clear what ingredients lie within, which is a comfort in of itself, and yet the flavors offer far more depth than what meets the eye. Standing behind the counter, anticipation builds with each step of the chef’s preparation. The chef in turn observes and takes cues from his guest’s every response as the meal progresses. It is not simply about his expression and his food – it is a conversation between all the components that make the dining experience. Right before you, velvety homemade sesame tofu is seared for a toasty aromatic finish, and barely-cooked eggplant is brushed with a stroke of miso paste to accent the sweet flavors that emerge from the firm texture. Given the simplicity of Mishina’s style, the quality of his ingredients is paramount. He sources his selected items through regular visits to Tsukiji and from farmers who deliver direct to him in Kagurazaka. He is not remiss to mention the importance of connections when it comes to fresh seafood and produce. Chef Jun Mishina is an extremely gentle and warm man with a soft character, much like a Buddhist monk. Born and raised in Yokohama, he has loved cooking since he was a small child. He is grateful to his mother who allowed him to join her in the kitchen from his early elementary school days, often to make pound cakes from fruits and vegetables. Suffering from kidney disease, he was constantly aware of the levels of sugar and salt in his foods, and he credits his sensitive palate to this connection with the pure flavors of foods. Year after year, his wish for the future contained one simple word: “chef”. 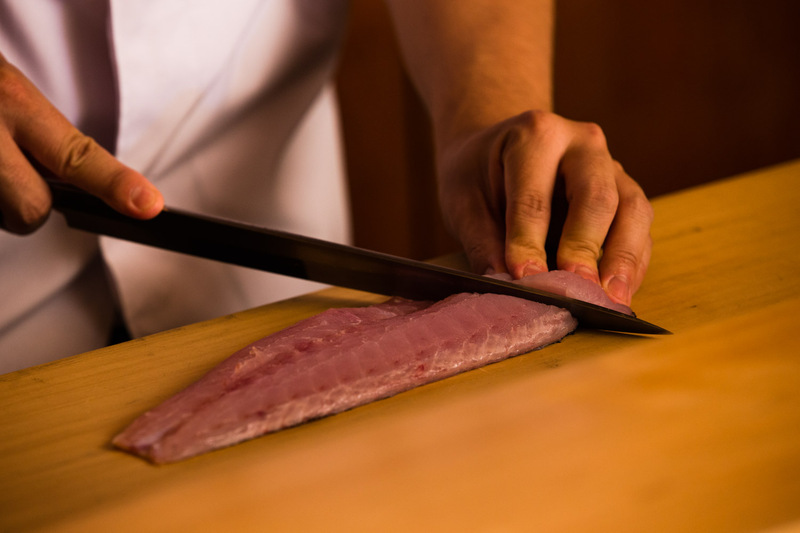 Straight after high school, Mishina attended Tsuji Culinary Institute. After graduation, he joined the school as a teacher, but realized his teaching had little relevance for students who hoped to understand the real workings of a restaurant kitchen. He got a part-time job at a Japanese restaurant in Tokyo with every intention to return to the classroom after five years. He quit soon after, not feeling up to the pressure and physical demands, and was seeking something more casual when an offer came that he felt he couldn’t refuse. At age 23, Mishina joined Ishikawa in Kagurazaka, and despite being in tears almost every day, he felt it his mission to persevere for just three years. He came under the wings of the master chef Ishikawa (of Kagurazaka Ishikawa fame) and the senior chef Koizumi (now head chef at Kohaku), for whom he has the deepest admiration, despite them being very strict in their nurturing of him. It is clear from talking to all three chefs that the tight-knit Ishikawa group is bound together by ties of diligence, kindness and mutual respect. After a year and a half, he was allowed to stand in the kitchen and witness for the first time the deep satisfaction of delighting guests with his food. He was hooked. He saw how being given a stage makes us naturally look for the way to perform and forces us to extend ourselves. He worked under Koizumi at Kohaku, and then as a chef at Ren, before being invited to take over as head chef at Ren in 2014, at the age of 30. In charge at the counter for the first time, Mishina noticed a somewhat diluted response from customers compared to what he had seen at Ishikawa and Kohaku. The answer wasn’t in his cuisine; it was in customer interactions. He realized that guests take home the whole dining experience and the part that was lacking was the conversation with guests. 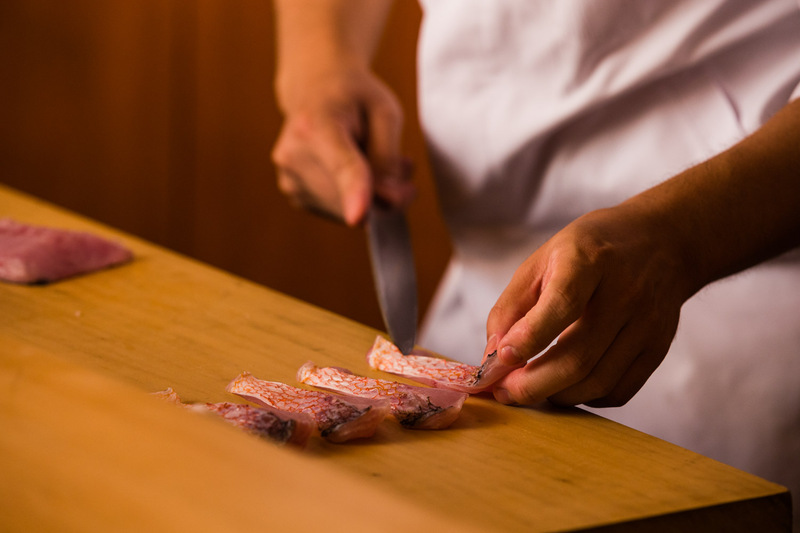 Little by little, he focused more on his guests, taking cues from them and learning from other chef’s and their interactions with customers, getting the feel for true Japanese hospitality. These days, working with three other young staff, Mishina is a natural, taking great joy in communicating the cuisine of his native country to Japanese people and overseas visitors alike. Mishina works diligently every day to polish his knowledge and skills, but still feels very much in the developing stages of his career. Learning English so that he can share his ideas with people from around the world, he also feels strongly about nurturing young chefs, and never fails to remind himself of the importance of enjoying what he does. These efforts all represent layers towards his ultimate aim of widening the circle of people who find delight in his cuisine. 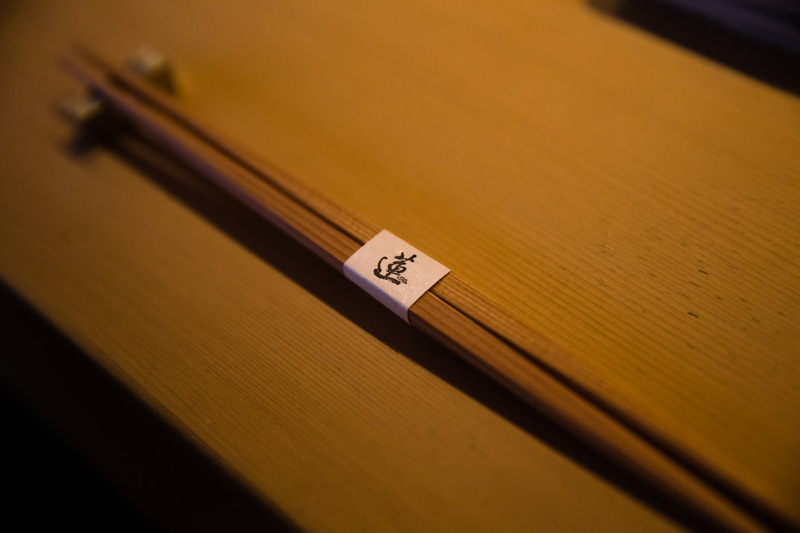 It is clear from a dining experience at Ren that he is gliding gracefully towards that goal. 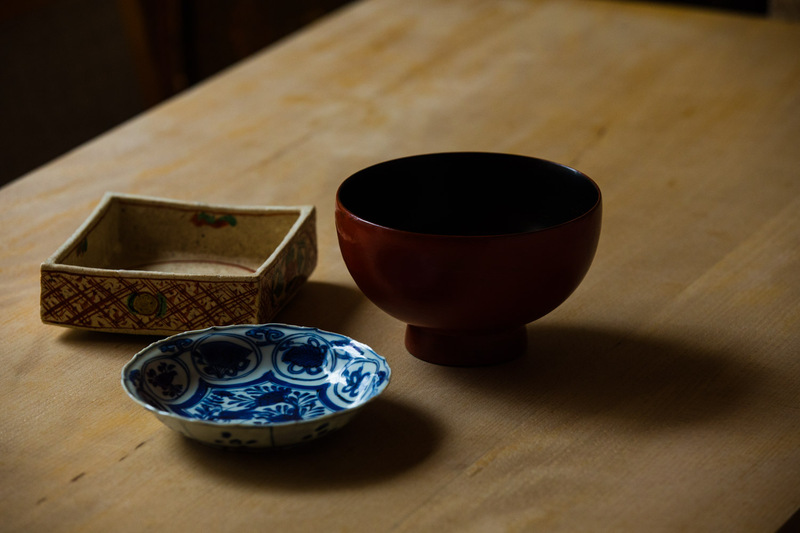 Ren’s refined and extensive tableware collection has been gathered through visits to galleries and exhibitions by the chef himself. The ceramic figure behind the counter is a piece by Kenichi Takanaka, a curious artist who lives a semi self-subsistent lifestyle. He makes many pieces in earthy creams and browns, inspired by his voracious reading of Chinese and Japanese classics, as well as Buddhist scriptures. 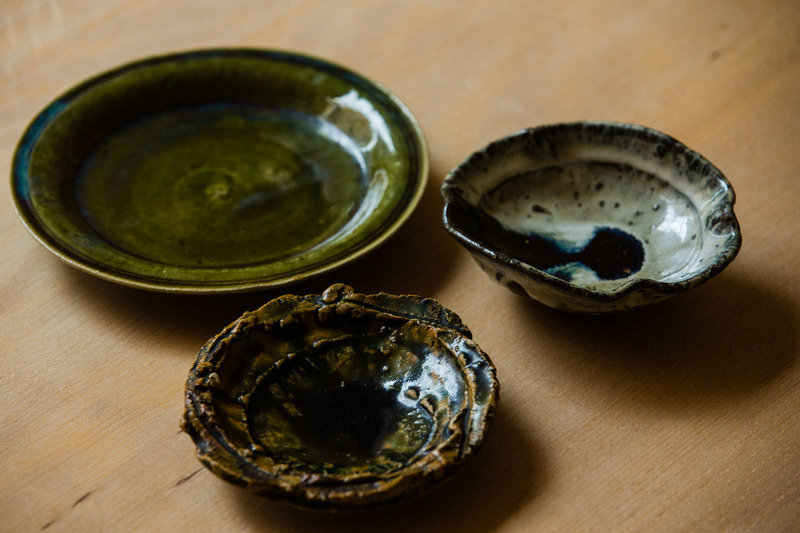 Chef Mishina also particularly loves pieces from ceramic artists Jinenbo Nakagawa from Saga Prefecture, and Kazushi Sato from Mino in Gifu Prefecture, a region famous for its pottery pieces since the Momoyama Period in the late 1500s. The bold reds, blacks, and yellows show strength in beauty, and perhaps the most famous are the forest green colors of the Oribe style.